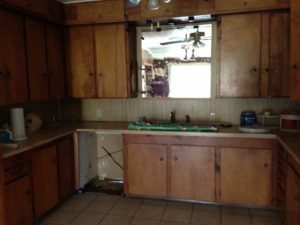 This was the kitchen, “before,” in 2013. April 18th, 2017 was my first official day on the job here with the Hermits. I had no idea that I would meet a sad house named “The Rattlesnake Annex” in the next couple of months and fall head over heels with the possibilities. I knew she needed a lot of work. I didn’t know just how much, or how in depth it would become. Maybe it’s a good thing that I didn’t know then what I know now. I saw her bare bones, and let my imaginationrun with what could be. That is probably the best way I could have ever started. The plumbing and electricity had been replaced, new septic tank had been dropped, the place had been cleaned up, walls torn down, new stairs installed and a barn was pushed down that seemed to help quell the rattlesnake problems that were there at first. I looked at it as needing sheet rock, paint, floor covering, cabinets, fixtures, etc. For that house, that would have been a prime example of “lipstick on the pig.” Rattlesnake has needed much more help to make her structurally sound again, and ready for a family to love her. The new plumbing has mostly been redone, the new electricity has been mostly redone, many mistakes that were made and covered up before and after Lee and Sue Ann bought it have been repaired and done correctly. 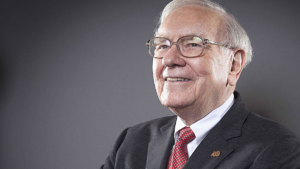 In addition to being one of the most successful businessmen history, Warren Buffett seems like a genuinely nice guy—at least as presented in the HBO special. As our resident MBA, Russell is the official Hermit Haus coach on goals. He leads our Thursday goals meetings and tries to keep us focused on the big picture. He’s very good at herding cats. Now, I’ve never doubted the efficacy of setting goals and implementing plans to achieve them. We have personal and corporate goals here at Hermit Haus. We set and review them at least twice a year. We track progress to those goals to some degree on a daily, weekly, and monthly basis. If fact, it sometimes feels like we spend more effort managing our goals than achieving them. And I have personally had difficulty with setting goals and focusing on them. There are just so many methods of identifying, writing, and planning your goals. I mean, there are SMART goals, long-term goals, short-term goals, performance goals, outcome goals, process goals, enabling goals, sustaining goals, and the list could go on forever and ever, amen. What Is a “Stretch Goal”? Don’t let your stretch goals tie you in knots. I’ve used the term “stretch goal” in a couple of posts about setting and meeting goals, without defining the term. In a nut shell, a stretch goal is a goal you set for after you accomplish your actual goal. Meeting your actual goals should make you happy. Meeting your stretch goals should make you ecstatic. Stretch goals are important for two reasons. They help you accomplish your actual goals by working toward something beyond them. When you accomplish your goals, you don’t have to take time out to rethink what comes next; you already know. That said, you shouldn’t focus on your stretch goals to the point where it compromises your ethics or causes you undue stress. Meeting your goal is a win. After that, not meeting your stretch goal is still a win. Each form of marketing costs money, time, and effort. It’s important to know what pays off and what doesn’t. Once you identify an area where you are falling short of your goals, it’s time to get to work. But how? Throwing more energy, time, and money at the problem may improve your performance, but it may not. This is where data comes into play. That same spreadsheet I talked about last time has a column that lists where each lead came from. That one piece of data lets me see where I need more work. 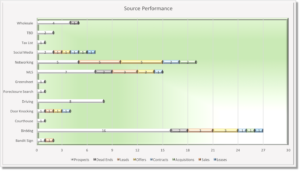 For example, the graphic shows that our efforts with bandit signs have produced only one prospect, but that prospect turned into an active lead. If you divide the resources we’ve spent on bandit signs, that is an expensive lead, but it could be worthwhile to continue this campaign if that lead turns into a successful project. On the other hand, bird dogs have been our most prolific source of prospects. They have a fairly high conversion rate and have already produced one successful project (carried over from last year as a long-term hold). After bird dogs comes MLS searches, networking, and social media. MLS searches generally produce lower-quality, lower-margin leads that I refer to as “light bill deals.” They pay the bills but not much else. Personal and social media networking have been our most successful campaigns. I understand this result is not that common, but we are a team of writers and trainers. We love what we do, and I hope it shows. If you’d like to work with us, sell us a house, or just get a copy of the spreadsheet I use to manage our performance, please email me or leave a comment. The green shows how much progress we’ve made toward our goals. The red shows where we haven’t made our goals to date, and the gray is our stretch goal. 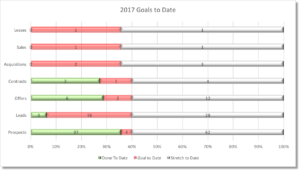 Red in the bottom half of the chart means we aren’t doing the work to meet our overall goals. As I said previously, “Setting your goals starts the process.” To ensure you meet your goals, you need a mechanism to track your progress. My solution is fairly simple. I list each of our prospects in a spreadsheet with dates that record each milestone. Any time I want, I can see how we’re doing. As I’m writing this, we’re starting to slip behind on the number of prospects we need to meet our goal this year, which means we’re also falling behind on all of our other metrics. Now I could simply say, “January is a slow time of year.” That would be a true statement, but it doesn’t help. I need to understand if the slippage is due to “a slow time of year” or something else. I have to be able to look honestly at our performance, especially my own, and determine if we really are doing everything we could be doing to meet our goals. You need a growth mindset to succeed in this business, and a growth mindset requires brutally honest self-evaluation. In this case, I determined one reason we’re falling behind is that I’ve let myself become too distracted by unproductive parts of the business. That’s something I need to work on. But another reason for the shortcoming is where our leads are coming from. Knowing that helps me focus our efforts better. Good evaluation requires good data and a system for recording and evaluating that data. If you’d like to work with us, sell us a house, or just get a copy of the spreadsheet I use to manage our performance, please email me or leave a comment. PS from your webmaster: If you want to receive Lee’s informative posts via email as soon as they are published, subscribe below. Be sure to look for our message of confirmation in your spam or junk mail folder!